While I was working on my article on the Burmese community in Pittsburgh for our upcoming special issue on Burma, I had the opportunity to spend a Saturday at a Burmese monastery. 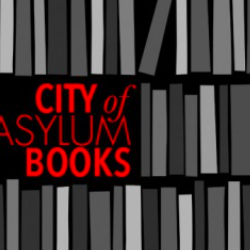 City of Asylum writer-in-residence Khet Mar offered to go with me and help with translation. I picked her up at her house on Sampsonia Way and we made the journey to Brentwood, a suburb about ten miles south of the Northside. Tucked into the rolling hills of that neighborhood is the Prospect Park housing complex, home to a diverse group of refugees including about 50 families from Burma. We parked in front of one of the nondescript brink buildings and Khet Mar called the monastery’s attendant, a cheerful man in a sarong who lead us up the stairs to an apartment. The only thing that alerted us to the fact that we were at a monastery was the neat row of shoes outside the door. Inside is an impressive wooden altar for a golden Buddha surrounded by pink and white flowers that serve as offerings. We were greeted by one of the monks associated with the monastery and sat cross legged as he explained that the monastery was begun by a group of Buddhists families living in Prospect Park. Right now there are two monks associated with the monastery and one attendant. In Theravada Buddhism, the type of Buddhism practiced by most Burmese Buddhists, monks are not supposed to cook or perform chores, so the attendant is needed to support the monks. As we talked the attendant brought out plate after plate of food, including bowls of oily dried fish, steaming rice, and a sweet dried pumpkin that I found addictive. Visitors to the monastery in Brentwood. Khet Mar is on the far right. 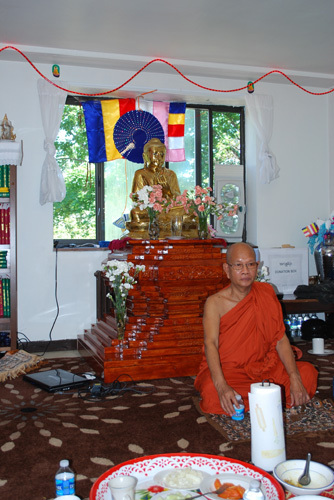 The monk estimates there are about 300 Burmese Buddhist in Pittsburgh and explained the small monastery enables the families engage in religious activities such as giving alms to monks, taking part in naming cermonies for newborns, and meditating. The monastery also serves an educational function to teach people about the Theravada practice and receive spiritual guidance. In Theravada Buddhism there is not set worship time and people are free to visit whenever fits their needs. While we were there, a family visited with their young daughter. The father showed his child how to give a glass of water in offering to the Buddha and explained to me—with the help of Khet Mar’s translation—how important is for him to raise his daughter in the Buddhist tradition. He said he was glad the monastery was there to help him teach his daughter the practices of Buddhism. Others dropped in to offer alms or greet the monk. While working on this article, I was impressed and moved by the resilience of the refugee community here. 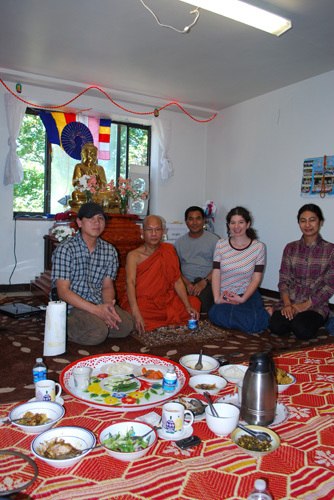 The monastery is just one of the ways the community comes together to celebrate and maintain their Burmese culture even though they thousands of miles from the country of their birth. You can read more about the Burmese community in our upcoming issue. 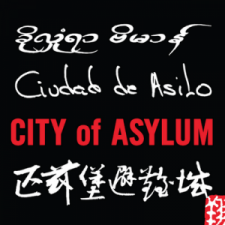 Click here to join our mailing list and receive a notice when the Burma issue is published. 3 Comments on "Photo of the Week: Monastery in Brentwood"
Thanks for your comment and, please, nitpick. Accuracy is very important to us! My map puts the monastery in Brentwood with Whitehall starting on the other side of Clairton Blvd and Baldwin slightly south of there. Maybe it’s outdated? The important thing, though, is the great work of the Greater Pittsburgh Literacy Council. I didn’t have space to cover your organization’s work in detail, but I do write a bit about them in the upcoming special issue. Language and literacy are the two biggest things the folks I interviewed mentioned as barriers to success. Thanks for trying to help break down those barriers! Hi – The name for Prospect Park changed to Whitehall Place a few years ago when the management changed, http://baldwin-whitehall.patch.com/articles/baldwin-whitehall-a-refuge-for-many-nations (I live in Whitehall…).